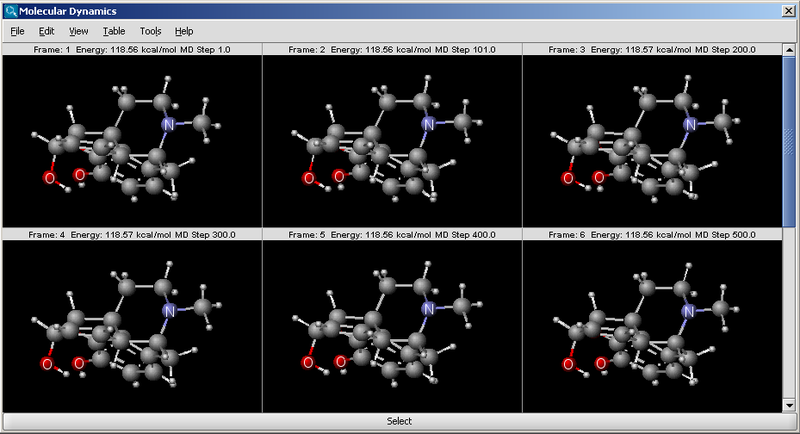 The Molecular Dynamics Plugin calculates the trajectory of a molecular system by integrating the equations of Newton's laws of motion. The generated trajectory can be visualized as a continuous animation or as a sequence of discrete frames. Animation: trajectory is displayed as an animation. Frames: trajectory frames are displayed individually (see above). Force field: force field used for calculation. Integrator: integrator type used for solving the equations of Newton's laws of motion. Simulation steps: number of simulation steps. Step time (fs): time between simulation steps in femtoseconds. Initial temperature (K): initial temperature of the system in kelvin. 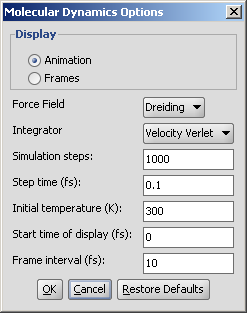 Start time of display (fs): the time of the first simulation frame to be displayed in femtoseconds. Frame interval (fs): time between displayed simulation frames in femtoseconds.